The CentRec receiver at the solar tower in Jülich during the practical test. Heliostats concentrate sunlight on the receiver in the solar tower. Researchers at the German Aerospace Center (Deutsches Zentrum für Luft- und Raumfahrt; DLR) have taken a major step forward in the development of receiver technology for solar tower power plants. 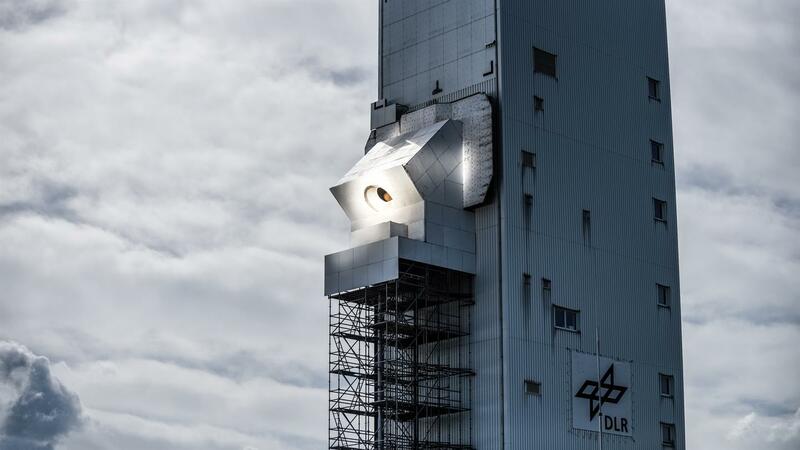 The innovative radiation receiver CentRec in the solar tower at the DLR facility in Jülich passed its first test at extremely high temperatures in May 2018. During the test, the researchers heated ceramic particles in the receiver to over 965 degrees Celsius, and in doing so demonstrated that concentrated solar radiation can be used to generate and store energy at very high temperatures. The CentRec technology developed by the DLR solar researchers opens up new possibilities for more efficient and cost-effective generation of electricity and process heat in solar thermal power plants. In a solar tower power plant, a large number of movable mirrors – referred to as heliostats – concentrate solar radiation and reflect it towards the top of a tower. A receiver installed there collects the radiation and converts it into heat. The CentRec receiver consists of a rotating chamber into which ceramic particles measuring approximately one millimetre across are delivered from above. The rotational movement of the chamber causes a centrifugal force to act on the particles. They are pressed against the interior wall of the chamber and heated to more than 900 degrees Celsius. Gravitational force causes the particles to migrate downward until they fall out of the receiver and into thermally insulated containers. The rotational speed of the chamber determines how long the particles remain in the receiver and therefore how hot they become. The heated ceramic particles are suitable for immediate use and can be coupled with the power plant process, for example in the generation of electricity. Alternatively, they can be used as a relatively easy to transport storage medium for the needs-based provision of thermal energy in a broad array of applications. The particles consist of bauxite and can withstand temperatures of more than 1000 degrees Celsius. They are also inexpensive and environmentally safe. 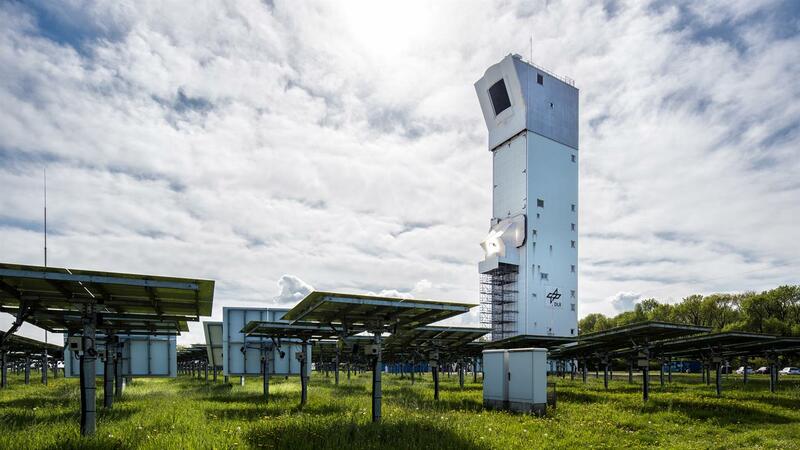 "Proof of a high operating temperature capability is an essential prerequisite for the intended marketing of our receiver concept," explains Reiner Buck, Head of Solar Tower Systems at the DLR Institute of Solar Research. The liquid salts that have been used until now as a heat storage medium are only able to work at temperatures up to approximately 550 degrees Celsius. Now, power plant operators can use the ceramic particles to work at higher process temperatures, leading to greater efficiency and lower-cost electricity. In the next step, the team under Reiner Buck will scale the CentRec technology to operate at higher power, which will further reduce the cost of producing electricity and solar process heat.